Even if that calculation is off by, say, a whole planet, it’s evident that the American lifestyle – with big homes, plasma TVs, multiple cars running on fossil fuels – is not a sustainable model. Serious threats to the environment, like global climate change, water shortages and pollution from industrial chemicals, continue to mount up, and well over half of humanity is already malnourished, according to the World Health Organization. Our consumer culture is based on a belief that happiness derives from having more stuff, and advertising is the driving engine of consumerism. The primary aim of much advertising is to create need where none previously existed. Whatever is being marketed, the message boils down to either you gotta have one if you don’t already or, if you already own one, you need a better one. Through his whimsical characters and rhymes, Dr. Seuss warned way back in his 1971 children’s book “The Lorax” of the threat to the environment when greed compels corporations to fabricate needs: Environmental devastation ensued when the book’s habitants were convinced they had to have “thneeds, which nobody needs.” An animated film adaptation of the “The Lorax” hit the theaters in 2012. When I was a kid, I once read that a person is never more than 10 feet away from a spider, so I’d contemplate what must be lurking under floorboards and sidewalks. Nowadays I find myself entertaining something more troubling, that I might seldom be more than 10 feet away from an advertisement. This occurred to me the first times I was force fed ads on the internet and on monitors in supermarket checkout lines or on gas station pumps. And, with the expansion of digital advertising onto smart phones and pads designed to be carried on your person, I suspect that many Americans spend most of their waking hours less than a foot from an ad of some sort. A question that begs to be asked is this, how much is all this advertising costing, and what kind of return do businesses get on their advertising dollars? Moreover, how much is spent advertising to me, the individual consumer? A hefty $313 billion were spent on advertising by businesses within the United States in 2011, according to “The Power of Direct Marketing,” a report released by the Direct Marketing Association (DMA), a global trade organization promoting direct marketing. The 2011 U.S.population was 311.8 million, so $1004 advertising dollars were spent that year wooing every man, woman and child to buy stuff. This figure includes all media forms of advertising which, in order of most to least ad dollars spent, are television, telephone, direct mail, online media, newspapers, magazines and radio. 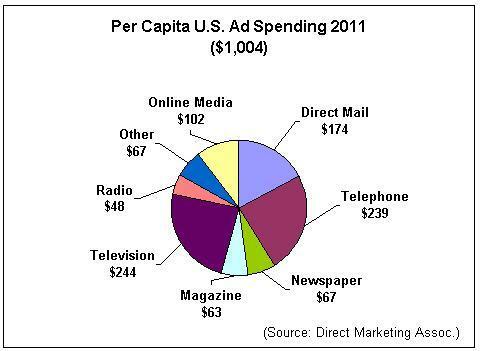 The above pie chart shows how the $1004 per capita ad expenditure breaks down by media. While an individual might rightly believe that he/she is not swayed by ads, here’s what the DMA’s report reveals about the typical American. Every ad dollar spent on general advertising, like national TV or magazines ads, yields an additional $5.26 in revenue, averaged across industries. 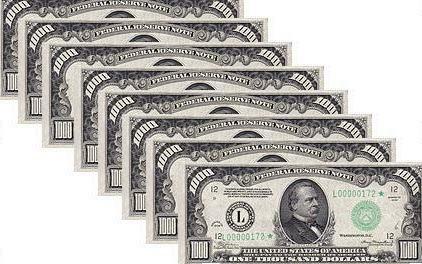 Direct marketing ads, however, generate the most bang for the buck, an added $12.03 in revenue. Direct marketing differs from general advertising by using a one-on-one targeted audience approach plus various tools to engage the recipient (e.g. telemarketers that call you by name). Anyone who uses social media or mobile devices, for example, knows how far direct marketing has expanded outside its original roots in direct mail. U.S. businesses raked in an estimated $2.7 trillion in ad-generated sales in 2011, or $8,659 per capita, according to DMA’s figures. One reason ads work so well is that they speak to the individual consumer as if he/she is the most important thing in the world and deserving of anything that could be desired, a message that is hard to resist. From an environmental standpoint, ads that employ greenwashing strategies are particularly diabolical as they convey that, by buying a certain product or service, the consumer is actually doing the environment a favor. Greenwashing means a company exaggerates or outright lies about the environmental benefits of its product, and it can take many forms. For example, a company might produce ads showcasing their product in a nature setting without implementing any improvements in an environmentally destructive manufacturing process. In the 2010 documentary “Greenwashers,” the filmmakers portray the transnational oil giant British Petroleum (BP) as the poster child of greenwashing. Named the most polluting company in the U.S. in 1991 based on toxic release data from the Environmental Protection Agency, by year 2000 BP had rebranded itself Beyond Petroleum and adopted a green & yellow sunflower logo yet continued to accumulate millions of dollars in fines for pollution and safety violations even before its infamous 2010 Gulf of Mexico oil disaster. Many Americans today are highly vocal in their opposition to the government telling them what to do. Yet, the fact that U.S. companies spend fully one grand a year on each of us, telling us what we should need or want, and we kowtow by spending over eight grand apiece, suggests we’ve accepted this role of the business sector in directing our lives, consciously or not. If we express any objection at all to the non-stop advertising targeting us, it’s only minor irritation. Advertising has tricked us into thinking we can and should have every conceivable bauble and convenience. We’ve completely lost sight of the fact that the basic human needs today are still food, water, shelter, transportation and healthcare. Everything else is really elective, and, if we have any conscience, the toll on the rest of the biosphere must be figured into our purchasing decisions. Advertising, especially the local kind, can no doubt be very helpful in finding a good deal when you’ve decided on a product or service, but I personally long for the days when freeway billboard signs were the most intrusive ads cluttering daily life. This entry was posted on Monday, April 16th, 2012 at 3:57 pm and is filed under energy, green business, politics, pollution, science, sustainable living. You can follow any responses to this entry through the RSS 2.0 feed. You can leave a response, or trackback from your own site. One Response to Advertising: Are You Buying It? thought this post was good. I don’t realize who you are but definitely you’re going to a famous blogger in case you aren’t already.